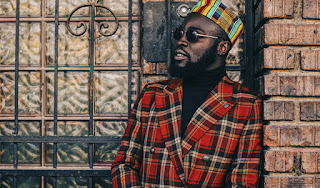 Ghanaian rapper, M.anifest will headline two Lake of Stars concert in March 2018. 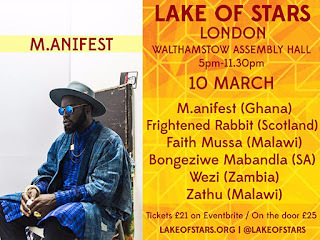 On March 10, M. Dot will perform at the Walthamstow Assembly Hall for the London edition of the festival, which also marks its 15th year. He will also perform on March 11 in Glasgow. Purchase tickets for LONDON EVENT and GLASGOW EVENT. Frightened Rabbit, Faith Mussa from Malawi and other acts from Tanzania, South Africa and Zambia are also billed to perform at the event. Ghanaian rapper M.anifest, in late February 2018 met American Rap Legend, Rakim in New York, United States of America. Born William Michael Griffin Jr., Rakim is widely regarded as one of the most influential and most skilled MCs of all time. He is one half of golden age hip hop duo Eric B. & Rakim. Prior to meeting Rakim, the godMC visited the New York office of streaming service, TIDAL, owned by Mogul Jay Z.